Note: There is a special instruction box you will see in the checkout process. You can copy and paste the following into the instruction box. Bamboo Cutting Board 18" x 12" x 3/4"
Custom laser etched cutting board. We will use your artwork or help you to create it and laser etch this item for a one of a kind gift. Call us today! 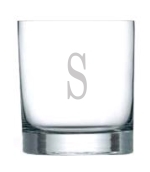 STÖLZLE NEW YORK BAR ROCKS GLASS, 11 OZ. Stölzle is a German International glassware manufacturing company. For over 200 years, Stölzle has been recognized as a leading European designer, manufacturer, and marketer of high-quality, 100% lead free crystal glassware for the foodservice and retail markets. Their professional design and hi-tech production process guarantees optimum durability, performance, and elegance. 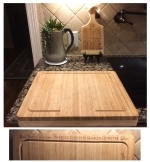 Your Mom's favorite recipe can be etched into wood and saved forever. Great gift to hand down for generations. Just scan the hand written note and send it to us. We will create the artwork and laser etch the image for an enduring memory.